The future of the security situation on the Korean Peninsula appears uncertain, despite an Olympic detente that has been feeding hopes for improved relations, and even an inter-Korean summit. On Monday, 38 North -- the North Korea analysis website operated by US-Korea Institute at Johns Hopkins University -- reported that North Korea’s latest experimental light water reactor appears to be nearing completion. 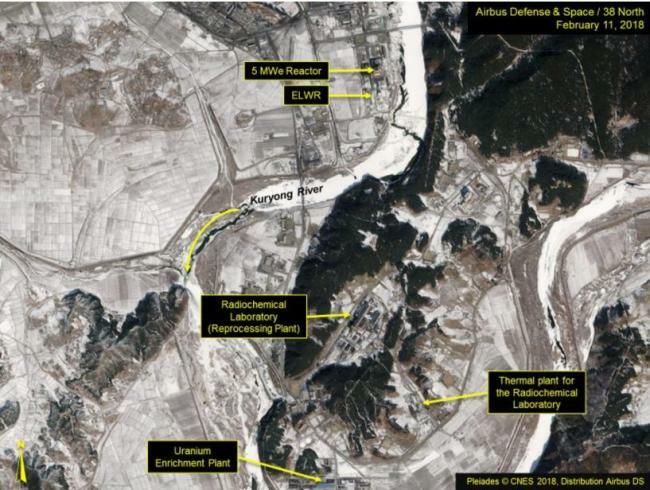 Citing satellite imagery of the North’s Yongbyon nuclear facility, 38 North reported that “steady progress” had been made on the reactor the North began constructing in 2010. According to the report, the reactor appears “externally complete” and a plutonium production reactor at the site may recently have been in operation. Speaking at the Munich Security Conference on Sunday, Sen. James Risch said that US President Donald Trump is committed to preventing North Korea from completing ballistic missiles armed with nuclear warheads. “If this thing starts, it is going to be probably one of the worst catastrophic events in the history of our civilization, but it is going to be very, very brief,” he said, rejecting the idea of “bloody nose” strategy. The strategy refers to a preventive strike targeting limited targets. While military option remains unlikely, the US and allies have reiterated on numerous occasions that any dialogue with North Korea must concern denuclearization. North Korea, however, maintains that its nuclear weapons program is not negotiable, and it has recently reverted to accusing the US of orchestrating tensions on the peninsula. Despite international condemnation, Pyongyang has its own list of demands, none of which have been received well by South Korea and its allies. One of the main demands by Pyongyang is for the South to halt all joint military drills with the US. The demand has mostly been ignored by Seoul and Washington, with top military officials hinting that drills postponed for the PyeongChang Olympics will be resumed in the near future. South Korea’s Unification Minister Cho Myoung-gyon -- Seoul’s point man on dealing with Pyongyang -- also hinted that joint drills are an independent issue. Speaking to lawmakers Tuesday, Cho said that the South Korean and US militaries are discussing the resumption of the drills -- Foal Eagle and Key Resolve -- after the end of the Olympic and Paralympic Games. Cho also stated that his ministry has no plans to oppose related developments. The unification minister also flatly denied the possibility of returning a number of North Korean defectors as demanded by Pyongyang. The North has demanded that Seoul return 12 individuals who escaped to South Korea in 2016 from a North Korean government-operated restaurant in China.